"We fell in love with the setting, it was just what we wanted, a home from home." 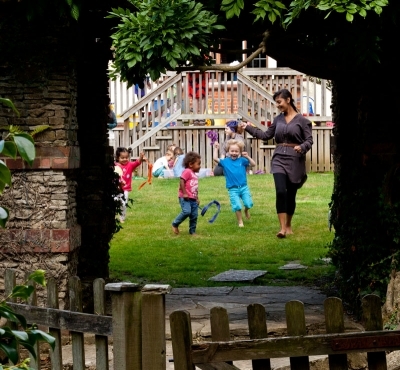 Welcome to Highfield Nursery School, an exceptional nursery and pre-school located in the Portswood Residents' Gardens Conservation Area in Highfield, Southampton. We care for and educate children aged from 12 weeks to eight years, providing a variety of services ranging from full day care, morning/afternoon sessions, before/after school and holiday care. Our staff are highly qualified and committed to our core values, which place the child at the centre of every decision we make. Sessions are from 8am-12:30pm or 1:30pm-6pm, Monday to Friday. Full day care is from 8am-6pm. Children can be dropped off at anytime within their booked period. Use the headings above to find out more about Highfield Nursery School. To find us on a map click here.